Basically, it is not keyboard accessible and only slightly screen reader accessible. They did not test this well at all. The information below regarding the screen reader usage is based on JAWS in IE. Differences with NVDA and Firefox have been added for two places where the experience is different. 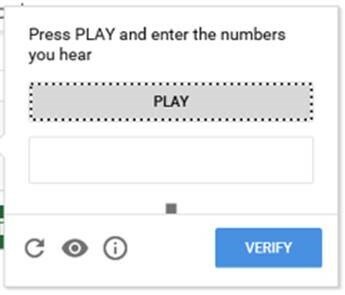 If you need assistance with this Recaptcha widget you will find this document of help through most of the expected interactions. The first tab will announce “I’m not a robot”. Use the space bar to select that. If you are a keyboard only user the displayed dialog will have images to select which are known not to be keyboard selectable. You will need to use your mouse to select the images and controls. If you need an audio method, use the tab key till you hear “Get an audio challenge button”. Select it with your enter key. It will announce “Play button”. Note: If you get stuck during the use of this widget and tab away from it, it may disappear from the screen. Since you have selected the Audio challenge the system remembers that. Subsequent selection of the I’m not a robot checkbox will only display the audio prompting and you will hear the Play button announced automatically. Note: sometimes when selecting the Play button JAWS may announce “Enter the numbers you hear, type in text”. This is still being announced when the first number is announced by the Captcha. 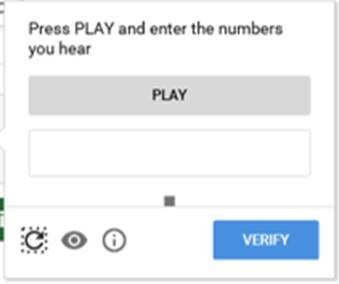 Select the Play button with the Enter key and focus will move to a text input field and you will hear 10 single digit numbers announced. As focus moves to the input field, JAWS may announce “Enter the numbers you hear, type in text”. This is still being announced when the first number is announced by the Captcha. These 10 numbers are slightly garbled with some background noise on purpose to foil automatic speech to text robots from understanding these numbers but they should be clear enough to understand. If you need to hear them again you can use the Shift+Tab key to return to the Play button and then use the Enter key to select it and focus will return to the input field and the numbers will be repeated. If you need new numbers you can tab two times and focus will go to the “Get a new challenge” button which you will hear. Select it with the Enter key and focus will move back to the Play button. Use the Enter key to select and focus will again move to the input field and you will hear numbers announced. Key in the numbers you hear the system announce. Sometimes there is a speed issue and you still may hear JAWS announce the number you entered (if you have that setting turned on) when the system is also announcing the next number. You may need to select Play again to hear the current numbers another time. Sometimes JAWS is not in Forms mode and as you enter numbers JAWS will announce a strange message. It may announce “No more headings at level (the number you keyed in) in this section” or “No placemarkers on current page” or some other JAWS message. 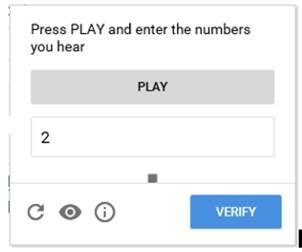 You will need to switch to Forms mode with the Ins+Z key and then reselect the Play button and reenter the 10 numbers that you hear. 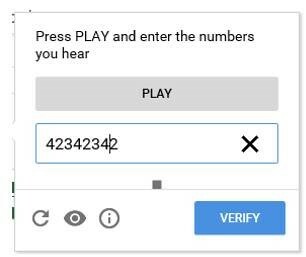 After you have entered the 10 single digit numbers you need to tab several times to get to the Verify button. Select it with the Enter key. 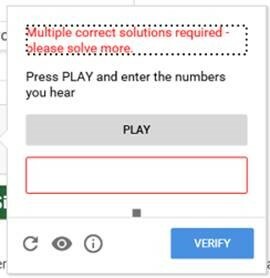 If you have not entered the numbers correctly an error message will be displayed and announced as “Multiple correct solutions required - please solve more.” You will need to tab to the Play button and repeat the process or use the Get new challenge button if you need to as well. JAWS announces the numbers as they are typed in but they are not in the input field. The user will have no idea that this is happening if they cannot see the screen. If the user back tabs and selects the Play button again all numbers will enter. However, they will have the previously entered single number still in the input field and it will be to the right of the cursor. They may not know that it is there and get an error upon Verify. They will need to clear the input field which they may not know about having only one number. NVDA did allow all numbers to be reentered and did show in the input field. If you have entered the numbers correctly the system does not announce anything but does display a green check in the checkbox. You can Shift+Tab to move back to the Password field and then Tab again and JAWS will announce the checkbox is checked. NVDA did announce “You are verified”. If you do not continue the login process in a timely manner (only a few minutes) Recaptcha will display a message in red text “Verification expired. Check the checkbox again.” This message is not announced by JAWS upon display and it is not announced by JAWS if you tab back into the checkbox. The only thing you will know is that the checkbox will be announced as “not checked”. Sometimes if you have attempted unsuccessfully several times you will get a message after selecting the Play button “We’re sorry but your computer or network may be sending automated queries. To protect our users we can’t process your request right now. For more details visit www.google.com/help”. At this point you can wait a few minutes and try again. 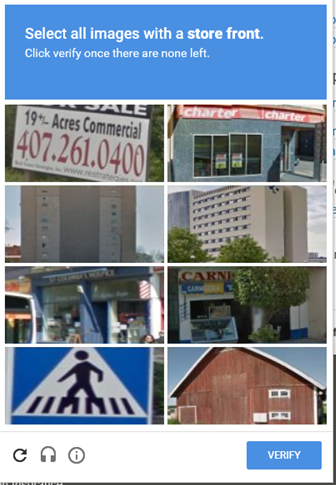 I am trying to understand if google's reCAPTCHA or noCAPTCHA is accessible or not? i have been reading online and it appears that there have been improvements. however there are some concerns especially when the captcha is not successful and it will go back to traditional method (not accessible). I personally have problem when i have to solve the image puzzles or with distorted text!recognize the text is not easy! Next message: Gijs Veyfeyken: "Re: reCAPTCHA or noCAPTCHA_ accessibility"
Previous message: Mohsen Mahjoobnia: "reCAPTCHA or noCAPTCHA_ accessibility"
In reply to: Mohsen Mahjoobnia: "reCAPTCHA or noCAPTCHA_ accessibility"
Next in thread: Gijs Veyfeyken: "Re: reCAPTCHA or noCAPTCHA_ accessibility"
Reply: Gijs Veyfeyken: "Re: reCAPTCHA or noCAPTCHA_ accessibility"